Pens and Markers for scrapbooking and crafting. We offer a nice selection of gel pens and glitter pens for coloring, journaling, card making, scrapbooking, and even stamping. This transparent pigmented ink dries to a glossy glaze look in 45-60 seconds. Does not bleed through most papers and vellum and is water resistant. Fabulous on smooth surfaces and clings to most non-porous materials - add 3-D texture to scrapbook pages cards wedding invitations ceramic and glass. 0.8mm ball produces 0.7mm bold line. 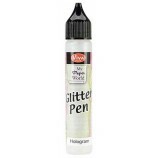 Viva Decor Glitter Pen: HologramQuick and easy! Add sparkle and dimension! Each easy-squeeze tube has a fine tip applicator so you can write, draw, doodle, whatever - on nearly any craft project. Non settling formula so the double-sided glitter doesn't sink to the bottom. Water and fade resisted, it dries to a gloss finish.